Hevelius says that A represents the Sun, while B, C, and D are “three valleys, surrounded by the highest mountains.” When the Sun is directly overhead , the valley is completely illuminated (represented by D), but when the Sun shines obliquely on the valleys (B, C), there are shadows that depend on the geometry. 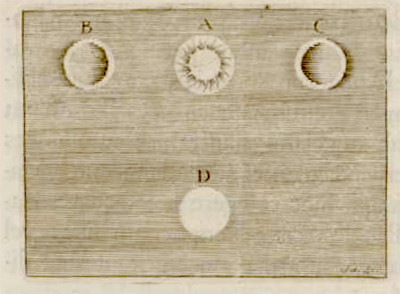 Observing at different times catches these shadows in different positions, making it clear to Hevelius that variations in brightness, in this case, are caused by topography rather than differences in the actual color of the surface. The same is not true, he points out, of the “Maria, Lacus, & Paludes” (seas, lakes, and marshes – the darker mare plains), which generally retain their dark color even at high sun angles. So cool! It might sound pretty straightforward, but understanding whether brightness variations on a remote planetary surface are due to actual differences in the properties of the material (albedo) or are instead due to shadows cast by topography is still a fundamental task in remote sensing today. We have a lot of information about the Moon now, what with all of the recent missions, but that’s not the case for most places in our solar system, where photographs from passing spacecraft are the primary, if not only, data available. When we look, for example, at the icy satellites of the giant planets and try to figure out what the landforms on their surfaces – which are pretty strange-looking, by the way – tell us about past and present geologic processes, we need to know first what’s topography and what’s albedo variation – and in that, we’re not much different from Hevelius.